The HDSP-6A is a 6-channel DSP amplifier with dual technology and has an output power of 8.000 W into 4 Ω. The HDSP-6A is a 6-channel DSP amplifier with dual technology and has an output power of 8.000 W into 4 Ohm. The Voice-Acoustic HDSP amplifier series has been developed with the most demanding requirements in audio quality and reliability in mind. With the high number of output channels, for the first time, it has become possible to separately filter bi and tri amping with the HDSP series cost effectively. The intelligent wide-range switching power supply automatically detects the AC input values making it possible to use anywhere in the world. The integrated loudspeaker management systems (DSP – digital signaling processor) work with a 64 bit/96 kHz sampling rate in audiophile sound quality. Premium converters offer a 120 db dynamic range and can process an input level of up to + 23 dBu. This amplifier series is specked out with the factory settings for the speakers, limiter and time alignment for the output channels. Additionally each input channel boasts 10 parametric filters (Bell, High Shelf, Low Shelf, Notch, Allpass), compressors, flexible routing, phase settings, a lengthy delay section for delays up to 275 meters, and an input limiter. The series is also equipped with enough memory to add your own presets for the use of loudspeakers from other manufacturers. The amplifiers are likewise available without Voice-Acoustic factory presets. The LCD display on the front side enables all functions to be manually accessed from a digital rotary encoder and buttons. 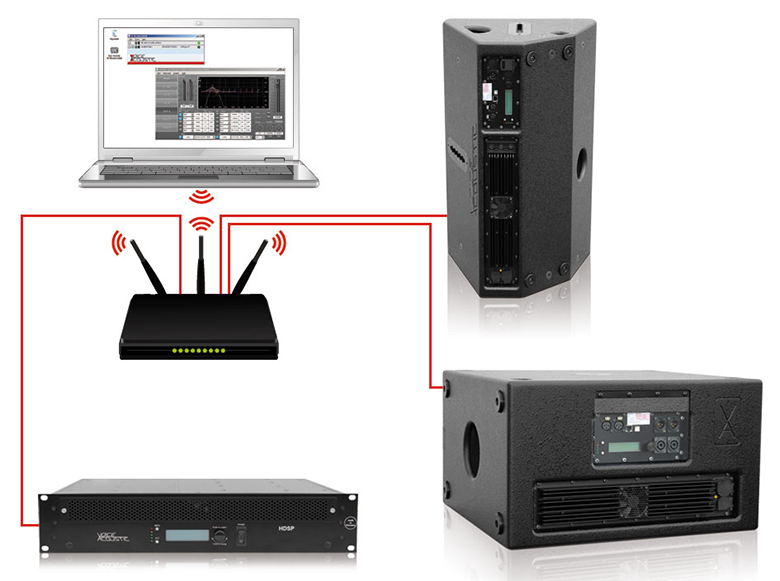 Our Voice-Acoustic’s VA-WLAN remote software for PC, Mac or App offers even more convenient access to these controls. This software makes it possible to link, remotely operate and monitor up to 128 individual HDSP amplifier units or self-powered loudspeakers in one common network. Linking is accomplished fully automatically via IP-address. 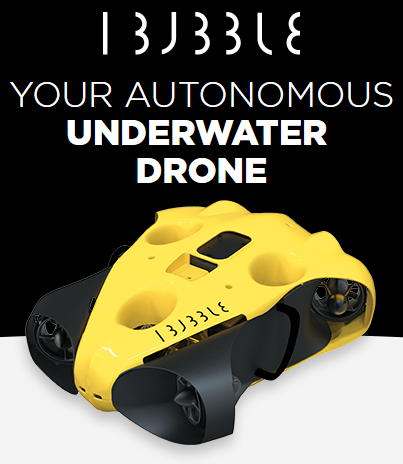 The connection operates bi-directionally in real-time and provides a diverse scope of system feedback (headroom, temperature, and impedance measurement). One major advantage of Voice-Acoustic power amplifiers is their modular capability. Multiples of highly effective state-of-the-art Class-D modules are fitted with separate power supplies and separate DSP boards to endure redundancy and guarantee supreme operational safety. This easy-to-service modular style allows for simple and fast exchange of components by any electrical assistant in a short time. 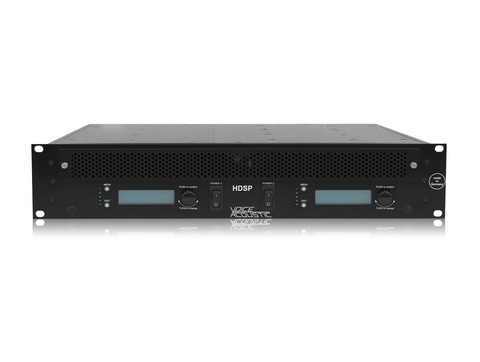 Compared to conventional multi-channel power amplifiers, which have to be powered with one power supply, the HDSP amplifier’s modular capabilities guarantee maximum performance and lots of headroom – even in a deep base range without simultaneously influencing other channels. The electronics have been mounted upside-down in the super sturdy 19" aluminum housing. Any dust particles will float to the floor of the box and not lay down on the platinum. All 2HE power amplifiers have identical housing and back cover plates.